We're beginning to see more stylish hybrids and electric cars, diminishing memories of golf cart-style EVs from years past. (The Tesla Roadster probably marked the official death of that perception.) Today, Lexus has unveiled photos of its LF-Ch compact hybrid concept ahead of the car's official debut September 15th at the Frankfurt Auto Show. It looks like a coupe at first glance, but that's an illusion due to the missing rear door handles and blackened B-pillar. It's actually a five-door hatch that takes some cues from the 2010 revamp of the five-door Mazda 3. 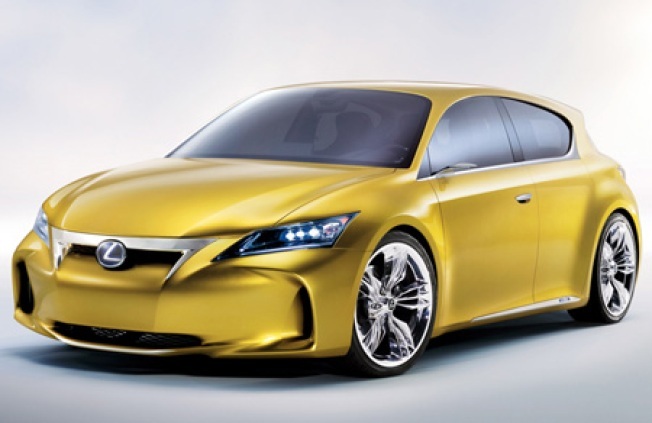 Under the hood, the LF-Ch employs the same hybrid powertrain as the production HS250h sedan. Inside, the car features Lexus' Remote Touch controller with user-adjustable haptic feedback, letting the driver and front passenger control the navigation, audio, and climate systems. Also, the seats light up, and rear passengers can dock an iPhone in the headrests.